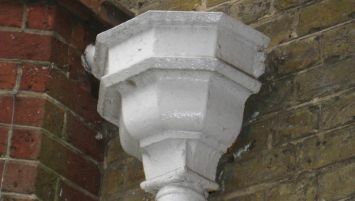 Cast Iron rainwater heads and hoppers had their heyday in the 19th century when a huge variety of decorative designs were produced. A number of companies still produce these designs or can recast existing hoppers. Guttercrest manufactures a range of cast aluminium rainwater hopper heads,whether you want an ornate, decorative or Victorian style rainwater hopper from our original 19 th century cast iron patterns. We can also manufacture hoppers to match originals, or, to your specific requirements, with dates or embellishments. A huge range of colours available including our heritage colour range. The tough polyester paint finish gives a long term low maintenance product. We also have a full range of traditional gutters and downpipes. Our ethos is to manufacture high quality products, with very short lead times at a competitive price. Hall & Botterill manufacture a comprehensive range of rainwater hopper heads and gutters, many of which are based on original Victorian and Edwardian designs. These handmade cast aluminium hoppers are made to complement cast, extruded and formed aluminium rainwater systems and suit round, square and rectangular downpipes. The range extends from small simple designs to large heavy-duty ornamental hoppers. Decorative motifs, dates and emblems can be incorporated on the designs. The hopper heads can be supplied in natural aluminium finish or polyester powder coated in a range of RAL/B.S. colours. We use only aluminium and our castings are gravity die cast. J & J.W.Longbottom Ltd are an old established iron foundry (1919), specialising in cast iron rainwater and soil goods, and ancillary castings. The product range includes: pipes, gutters, fittings, hopper heads, gratings, air bricks, wall plates and pavement lights. A 40 page fully illustrated catalogue is available on request. Rainclear Systems is the largest stockist and distributor of Cast Iron, Aluminium and bespoke metal rainwater systems in the UK, with over 30 years experience. They hold a vast stock of gutters, downpipes, hopper heads and all the fixings required for heritage projects, with an extensive range of gutter profiles including half round, Victorian and Moulded ogee, and can produce any bespoke design. Standard ranges of cast iron and cast aluminium systems are available in both milled/primed and pre coated black with guaranteed delivery within 24 hours. The knowledgeable and friendly customer service team are ready with support, options and pricing.